Capillary morphogenesis protein 1 (CMG1) is a 600 amino acid protein and has a calculated molecular mass of 65 kD. CMG1 contains a coiled-coil domain (which shares 24% identity with myosin heavy chain sequences from various species) and several putative phosphorylation sites. Bell et al. (2001) determined that CMG1 was 1 of several transcripts upregulated by umbilical vein endothelial cells during capillary morphogenesis in 3-dimensional collagen matrices. 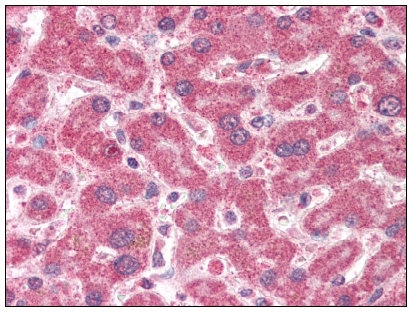 RT-PCR detected highest expression in adult and fetal kidney and lower expression in adult heart, placenta, lung, liver, and pancreas, and in fetal heart, lung, and liver. Little to no expression was detected in adult brain and skeletal muscle or in fetal brain, thymus, and spleen. Transfection into epithelial tumor cells revealed targeting of fluorescent-tagged CMG1 to an intracellular vesicular compartment. 1. Momeni P et al. : Analysis of IFT74 as a candidate gene for chromosome 9p-linked ALS-FTD. 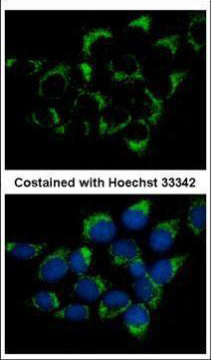 IFT74 polyclonal antibody ( Cat # PAB6611 ) staining ( 0.3 µg/ml ) of 293 lysate ( RIPA buffer, 35 µg total protein per lane ) . Primary incubated for 1 hour. Detected by western blot using chemiluminescence. Antibody staining (0.3 µg/ml) of 293 lysate (RIPA buffer, 35 µg total protein per lane). Primary incubated for 1 hour. Detected by western blot using Chemiluminescence. TA302937 staining (0.3µg/ml) of 293 lysate (RIPA buffer, 35µg total protein per lane). Primary incubated for 1 hour. Detected by western blot using chemiluminescence. Immunofluorescence analysis of methanol-fixed A431, using CMG1(TA308304) antibody at 1:500 dilution.